I just watched Henry Winkler who played Fonzie in the TV show Happy Days on a morning talk show recount how he felt like a failure as a child because he had dyslexia. He said his parents, even though they wanted him to succeed called him dumb. Mr. Winkler said that he held no grudges against his parents because all that he went through brought him to where he is today. He has even written a book series Hank Zipzer Collection to encourage children who also feel like a failure. There are many reasons other than dyslexia that we and those around us feel like failures, whether it be something out of our control or a mess of our own making. When I did a little background search about Henry Winkler to write this, two things stuck out. The first was that it said he always wanted to be an actor. So, even with all his failings and discouragement, he had a dream. Remembering our dreams and goals when we are discouraged can take us a long way. If you fall in a hole, the goal of reaching the top of the hole will give you motivation to climb out. In those times when we feel like we are failing, we need to just stop and reevaluate our dreams. We can then turn our dreams into manageable goals and start climbing one step at a time. God wants us to give him our plans and goals so that he can direct our steps on the climb. The other thing that stood out to me in my research of Mr. Winkler was that it said he was raised Jewish but that he was not religious as an adult. This is so sad. If you are reading this take a moment to pray for Mr. Winkler. I think we often forget that celebrities are people too and that Jesus died for them just as he did for us. So, pray that after all the wonderful things he has accomplished that he will not miss out on the best thing of all. 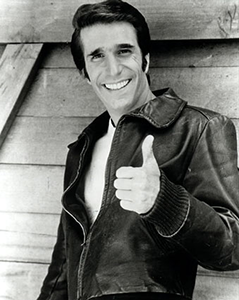 Being Fonzie or none of Mr. Winkler’s other accomplishments will get him into heaven. It will come down to the same thing that it does for all of us, whether he knows Jesus. I almost ended this with I would love to see Fonzie in heaven. Wouldn’t you? But I think a better ending would be I pray that I will see Henry Winkler in heaven. Great post! And, when I was a boy, I wanted to be "The Fonz!"